The Boson Herald absolutely owns the Sherri Killins story, and today our feisty local tabloid adds another chapter to the saga of the Moonlighting Moonbat (our formulation). NEW HAVEN, Conn. — The state’s former early education chief finally broke her silence yesterday, saying she gave “everything” she had to her $200,000-a-year job, worked nights and weekends to make up for her controversial moonlighting internship and racked up nearly 100,000 miles the past two years commuting to the Bay State from her home here. “I gave everything I had to Massachusetts. … I gave everything I had. 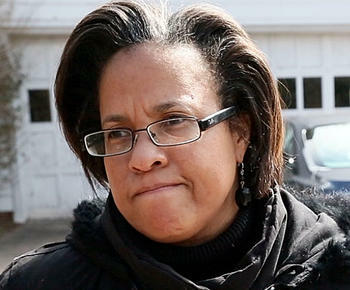 Massachusetts is in a good place, it is a good time for me to move on,” Sherri Killins told the Herald in the driveway of her white two-story Colonial, where she’s lived while heading the $499 million Department of Early Education and Care, and training as a future school superintendent in a 300-hour internship at Ware Public Schools. And there’s plenty more for the Herald’s bloodthirsty mob to chew on, and – as these comments indicate – they totally masticate Killins. This entry was posted on Saturday, March 16th, 2013 at 5:02 pm and is filed under Uncategorized. You can follow any responses to this entry through the RSS 2.0 feed. You can leave a response, or trackback from your own site.